For much of my life, I was largely indifferent to cauliflower. It was something I might pick from a veggie tray if the carrots and cucumbers were gone. Raw, it was Bunnicula’s broccoli, sort of crunchy and faintly bitter. It was, I guess, okay. I felt similarly about steamed cauliflower. It was milder and softer. It was fine. I’d eat it if it was put in front of me, but it wasn’t the sort of thing I felt compelled to make for myself. And then I discovered roasted cauliflower, and my relationship with the palest of brassicas was no longer indifferent. 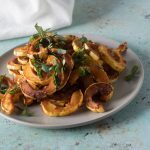 When roasted, cauliflower, like Brussels sprouts or broccoli or kale, transforms into something caramelized and nutty with deeply browned crispy edges. It’s so much better than okay or fine. It’s wonderful. Since that discovery, cauliflower started making its way into my grocery basket on a regular basis. 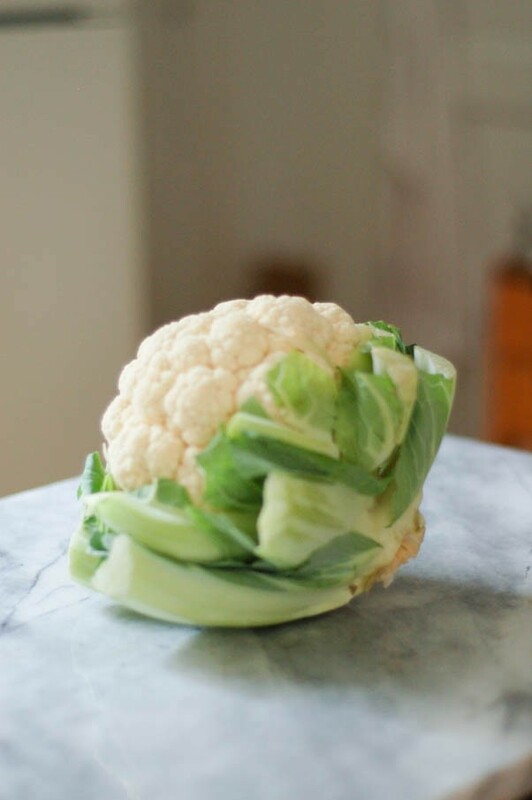 It’s lovely roasted with olive oil and sprinkled with salt, but roasted cauliflower plays so well with so many other flavors, that it seems a shame to limit it. 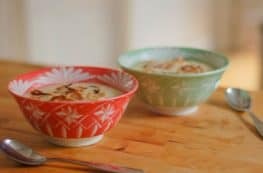 It’s lovely with Mediterranean flavors, like garlic and lemon and red pepper flakes, or Indian curry powders, or Middle Eastern notes like cumin and coriander. Here, roasted cauliflower gets tossed in a sweet and spicy Korean barbecue sauce that’s usually used for Korean fried chicken. And this way it is, I think, utterly beguiling. The sauce comes from Saveur and it involves gochujang and soy sauce and sesame oil and rice vinegar and generous amounts of garlic and ginger. It’s salty and sweet and spicy with loads of umami. I could, perhaps, eat the sauce on its own. It’s the sort of sauce that I might, if no one is looking, swipe from the bottom of the bowl with my finger so I can have one more taste after I’ve eaten everything it was clinging to. But, as good as it is on its own, somehow it tastes even better paired with the silky soft center and burnished edges of the roasted cauliflower. It makes a fantastic side dish to something like Korean fried chicken, but it can also be bulked into a full vegetarian meal when topped with a crispy fried egg or served with cubes of yellow tofu with or without rice. It’s the sort of preparation that doesn’t just make me want to eat my vegetables. It makes me want to devour them. 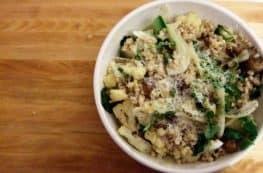 This is one of my all time favorite ways to eat cauliflower. 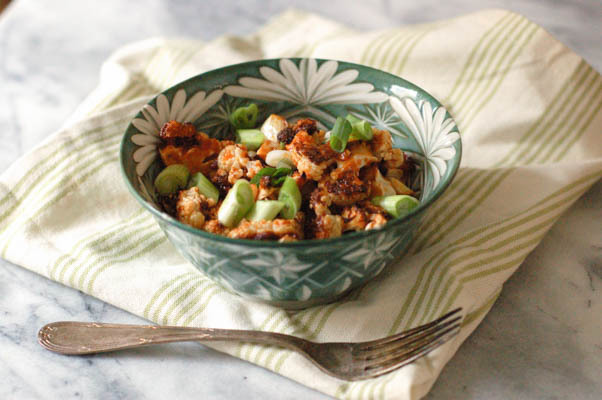 The sweet, spicy, salty, garlicky, gingery Korean sauce is so good with the nutty roasted cauliflower. 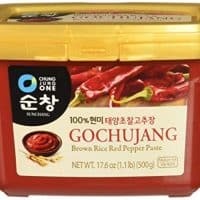 Gochujang, a Korean red chili paste, can be found at most Asian grocery stores or online. If you wish to make this gluten free, use tamari instead of soy sauce and check the label on your gochujang (some contain wheat, some don’t). It is vegan if you use brown sugar or agave nectar instead of honey. You might want to double the sauce. It keeps well, and it’s delicious on chicken, eggs, tofu, and probably lots of other things as well. Preheat oven to 425°F. 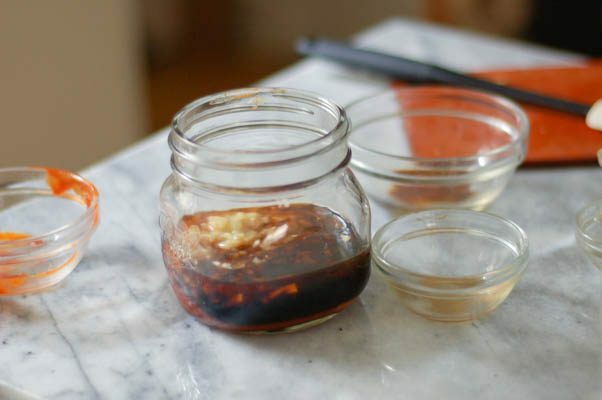 Add the garlic, ginger, gochujang, soy sauce or tamari, rice vinegar, sesame oil, and honey or brown sugar to the bowl of a food processor (or blender or stick blender) and puree until smooth. In a large mixing bowl, toss the cauliflower with neutral oil to coat it. Spread it out in a single layer on a baking sheet and sprinkle with salt (use restraint here, you want to season the vegetable, but there’s plenty of saltiness in the sauce). Roast for 25-30 minutes or until deeply browned. Toss with the sauce in a large bowl. Top with scallions. cauliflower soaks up everything so nicely! i can imagine that this would be a really tasty (although perhaps americanized) banchan. I make no claims to authenticity on this one (my knowledge of Korean cooking is limited), but yeah, I think it fits a rough Americanized definition of banchan. And regardless of any of that, it’s the kind of thing I want to eat all the time. This cauliflower looks fantastic! What a great take on Korean food! I am saving this and definitely giving it a try! i love korean food! Yum! And i really love cauliflower too so will try this! Thanks, Medina! I hope you like it! for some reason, i have always liked cauliflower and i roast them, which is even better. Agreed. 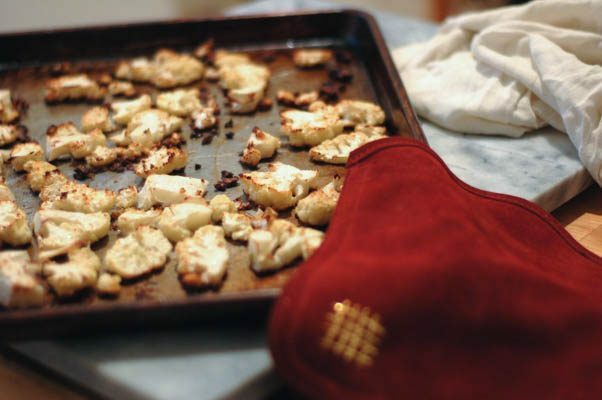 Roasting cauliflower is pretty much my favorite way to cook it. Beautiful pics and a great recipe! Yum! Love anything cauliflower since it’s so hearty and filling. This recipe sounds amazing! Thanks, Chelsea! I hope you try it. Would love to try this but alas…have no gochujang on hand…is this a necessary ingredient in this sauce or is there anything to sub it for? Chris, I’m afraid gochujang really is necessary for this one. It has a unique flavor profile–sweeter, funkier, with significantly less heat than something like sriracha. You may be able to find it at your local grocery store. 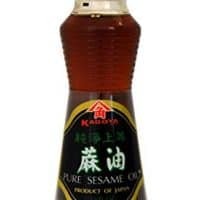 The Annie Chun brand is widely distributed and is often in the aisle with other Asian ingredients like soy sauce. And many other brands are available online. Gochujang really makes the dish. It’s worth going a out of your way to get some. Thanks Mary, I’ll try and find it! Any other ideas and or recipes to try that call for it? Sure. 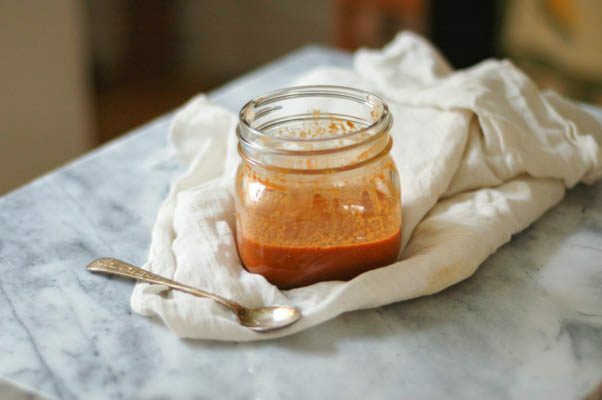 Gochujang keeps pretty much forever, so you have plenty of time to use it up. I’ve had my eye on this gochujang spaghetti from Lady and Pups. And Bon Appetit has a collection of gochujang recipes here. That should get you started. Also, the sauce for this cauliflower is great on lots of other things, other vegetables, chicken, rice, etc..
Here’s a youtube video with an audio of the pronunciation 🙂 Mostly sounds how it looks. This might be reaching too far, but – what if I made these into small pastry bites for a shareable party dish? 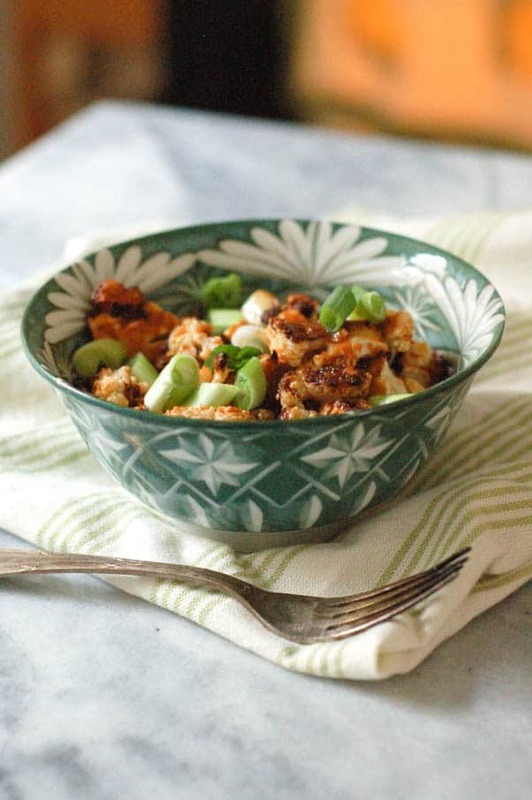 What else would you add besides the cauliflower and scallion as the filling? Anything? Sarah, I think that could totally work. I don’t think you’d need to add anything else to the filling, but if you wanted to give them more color you could add a sprinkling of fresh herbs (something bright and fresh like basil, cilantro, parsley, or mint). If you *really* wanted to gild the lily, I think they’d be kind of adorable topped with a fried quail egg (but those aren’t always easy to find and frying all those tiny eggs would be a real pain, so I’m only suggesting that if you, like me, have a tendency to do things the hard way). Let me know what you end up doing and how it works out! 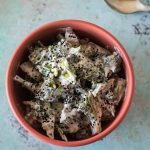 I made this recipe for my Korean husband, and he loved it! So glad I found your recipe! Thanks, Ellen! I’m so glad you liked it. I really wanted to change it up. I sort of dream-googled what I would want in my roasted Korean cauliflower and got your recipe. Fantastic! So happy when I found it. I have now printed it out, shared on Facebook and put it on a recipe card. The only thing I changed was I added MSG ( no it is not bad for you).